I found this recipe at the back of a recent issue of Southern Living. 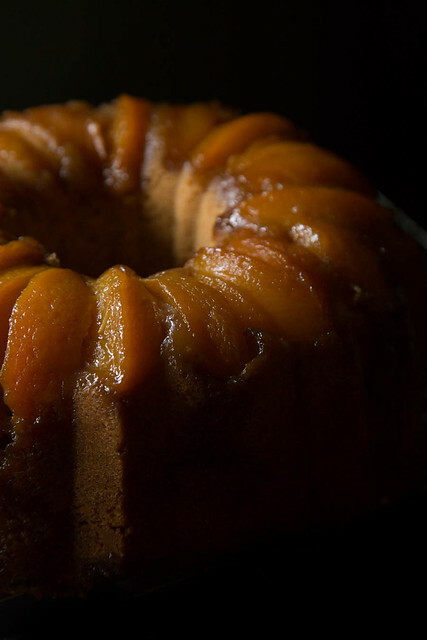 Well, sort of this recipe, they actually call it an Upside-Down Bourbon Bundt Cake, but I didn’t use any bourbon and I used some ginger sugar and called it a peach pound cake because alliteration is never a bad thing. Anyhow, I knew I had to try it when peach season came along. And I did try it, but the recipe had some questionable parts and the end result was okay but could use some work. So I made it again, and boy howdy! What a cake! 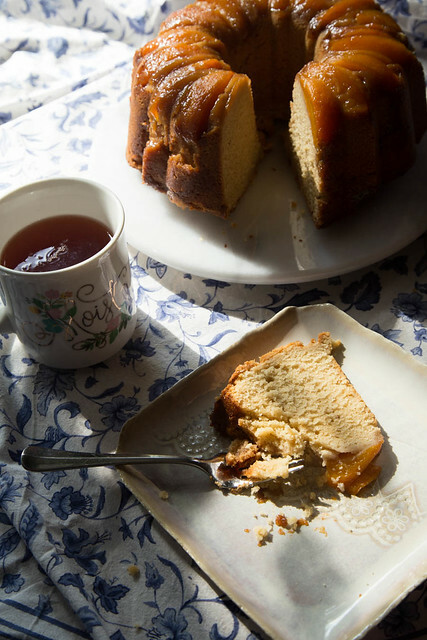 Worthy of daydreams, it’s the sort of cake that will inspire a multitude of variations. Heavily* grease a 15 cup (10.5 inch) bundt pan. Place rack in the center of your oven and preheat to 325°F. Melt butter and brown sugar for topping in a small saucepan over medium-high heat, whisking constantly until sugar and butter become one and mixture begins to bubble. Pour this thick sticky mess into the bottom of your pre-greased pan. Place your peach slices in an even layer on top of this. Now on to the cake! Beat cream cheese and butter on medium speed until creamy, a minute or so. Add all the sugars: ginger, plain, and brown. Beat on medium until light and fluffy, roughly 3 to 5 minutes. Add eggs one at a time, mixing until the yolk just disappears before you add the next one. Add vanilla extract. Combine honey and warm H2O ~ stir until honey dissolves in sugar. Combine sifted flour and salt. Add these alternatively, starting and ending with the flour mix. Blend until just mixed. 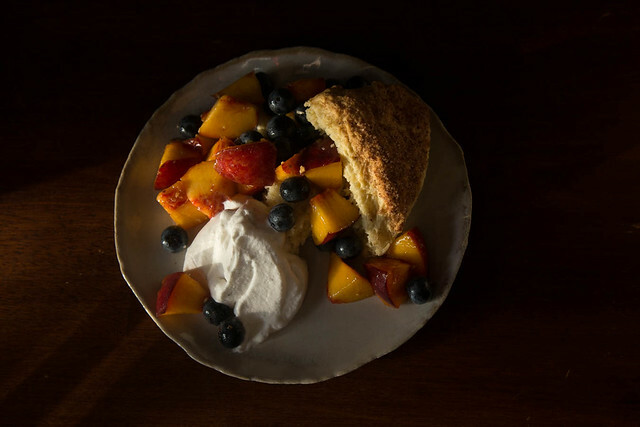 Spoon batter out onto your peaches layer. Bake for 1 hour and 25 or 30 minutes, until an inserted toothpick comes out clean. Cool in pan on a wire rack until it is cool enough to handle but still hot. Turn the cake out onto the wire rack and let cool completely. 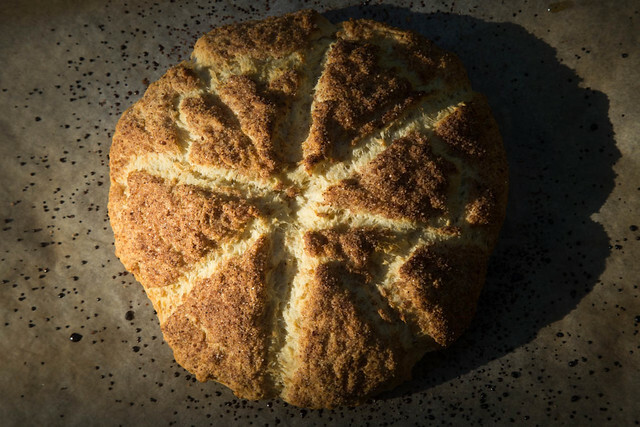 Serve with coffee and good conversation. *Yeah, you heard me, bold AND italic, the caramelized sticky sugar peach topping is exactly that, sticky, it will stick to your pan so make sure you grease it properly.